The small car competition has never been fiercer. Toyota’s new Yaris has hit the streets, the Suzuki Swift is selling a storm and Honda’s Jazz has earned a loyal following. And don’t dismiss the Ford Fiesta, Mitsubishi Colt, Mazda 2 NEO and Hyundai Getz – there are plenty of great cars in this category. So where does the new TK-series Holden Barina (nee Daewoo Kalos) fit in, you ask? At the bottom end of the market with a cheap price. The five door version of the Korean-built Barina kicks off at a mere AUD$14,490 but by the time you add ABS and alloy wheels (as tested) you’re talking AUD$15,680. This brings the Barina roughly inline with the base Suzuki Swift – and we much prefer the character-packed Suzi. 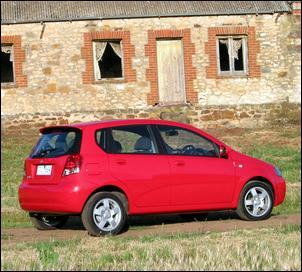 As part of Holden’s ‘Australian-isation’ of the original Daewoo design, the TK Barina is fitted with a relatively large 1.6-litre four. This is perhaps the car’s biggest selling point. With 77kW at 6000 rpm and 145Nm at 3000 rpm, the 1100kg Barina five-door can accelerate to 100 km/h in less than 12 seconds (and note that our test car was also pretty tight with just 2500km on the odometer). But the engine is not as flexible as you might imagine – on several occasions we were forced to down-change to maintain speed up small hills. Engine noise is also intrusive at high revs and there is an engine management stutter when applying throttle during times of high manifold vacuum (such as when coasting down a hill). Our test car came fitted with the standard 5-speed manual gearbox that uses a lift-up collar to engage reverse gear. We had no problem finding gears but the closeness of the pedals caught us out on several occasions – it’s very easy to squeeze the accelerator pedal while applying the brakes. A 4-speed auto transmission is available if you cough up an extra AUD$2000. 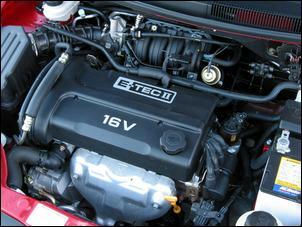 Fuel economy is pretty much what you’d expect from a small 1.6-litre hatch. During our test, we averaged about 8.5 litres per 100km over a mixture of city, urban and country driving. Adaptive knock sensing allows the engine’ 9.5:1 compression ratio to survive on normal unleaded fuel without any sign of detonation. With the appropriate tyre pressure set, that harshness and thumping was eliminated and the ride became quite comfortable. There’s plenty of travel to absorb speed humps tackled at high velocity and broken bitumen is effectively ironed out. Handling is quite well balanced although it does become twitchy when pushed and the trailing arm torsion beam rear axle can get unsettled over mid-corner bumps. 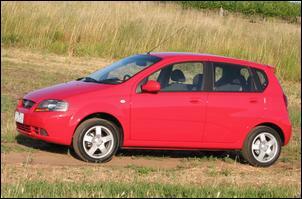 Chucking the Barina around is also quite an uncomfortable exercise due to the seats’ lack of lateral support. The optional ABS brakes of our test car performed well (despite using cheap drum rear brakes) but the chassis felt slightly unstable during hard braking manoeuvres. The power-assisted steering gives some unwanted feedback and kickback when driven enthusiastically over B-grade roads. There is also tram-lining which, curiously, is more noticeable on country roads than in urban conditions. The standard wheel diameter is 15 inch and our test car came with optional alloys wearing 185/55 Hankook tyres. These provide relatively low outright grip but offer progressive break-away and low noise. Inside, the Barina feels like it’s years behind its rivals in terms of styling and sophistication. There are a couple of shiny blanking trims in the centre of the dash and the forward edge of the front passenger door trim has a peculiar, large blanking plate. It appears this plate covers the opening for the electric mirror switch in left-hand drive models. Interestingly, the Barina’s switchgear feels better than the more upmarket Holden Viva but the left-right switch for the power mirrors is miniscule – in what other car would you find a switch about the same size as a Tic Tac? On the upside, you get easy to use controls, air conditioning, power windows, remote locking and front airbags. There’s also a no-name CD/MP3 head unit that provides better than expected sound quality. 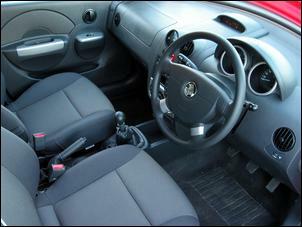 The sound system can also be controlled via steering wheel switches. Holden has added silver plastics to the door pods, steering wheel spokes and HVAC control surround. These are sure to get scratched during normal use. Much to its credit, the five-door Barina offers plenty of space for four people. The upright design of the body provides good headroom and given the class, there’s ample floor and knee room. Cabin width is also fine for four passengers but a fifth person would make for a very uncomfortable squeeze. Unfortunately, the Barina’s rear passenger space comes at the expense of cargo area volume. 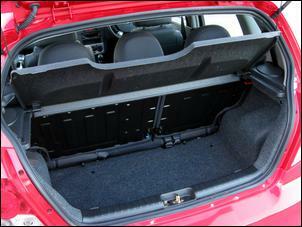 With the back seat upright, the cargo area is quite limited – enough to fit two or three plastic bags but that’s it. For greater cargo space, the 60/40 split backrest folds forward without needing to remove the rear head restraints – but it’s a struggle to avoid tangling the seatbelts in the process. Unfortunately, the back of the rear seat is also an exposed painted surface that is sure to be scratched when loading heavy objects. 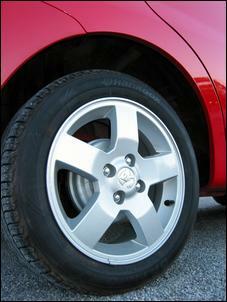 A full-size spare wheel can be found under the false floor. Paint finish is very poor in this area. 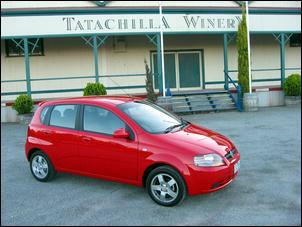 The body is quite basic but the Chilli Red paint and alloy wheels of our test car give the Barina some visual appeal. There are no side protection mouldings but a rear spoiler, colour-coded bumpers and mirrors come standard. With a 3-year/100,000km warranty and recommended service intervals set at 12 months/15,000km, the Barina is likely to be a reliable and cheap to run. But overall, it’s a mediocre package that struggles to compete against its rivals. Sure, the Holden is a bit cheaper than most other small hatches – but we don’t reckon that's enough of an incentive to buy.